Sigma Nylon Chest Waders are built using the latest technology and Shakespeare design. Lihghtweight and hard wearing the Sigma nylon waders have withstood a vigorous field testing period. 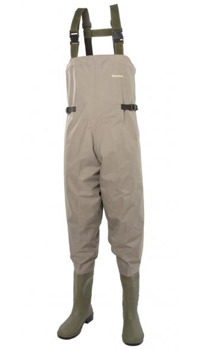 Lightweight and Heavy Duty Nylon Chest Waders in stockingfoot and boot footed styles from leading manufacturers. 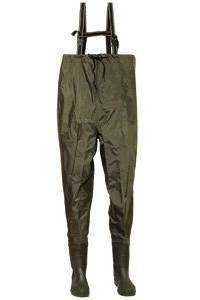 Waders in waterproof nylon PVC with top quality rubber boots. Snowbee's 150D Rip-stop Ballistic Nylon material is lighter, tougher, more durable and more flexible than the old PVC, so offers the wearer greater protection coupled with added wearer comfort. American Style full cut, with seams up the outside of the legs and a single front-to-back crotch seam to avoid chaffing. Adjustable webbing braces with elasticated rear section and quick-release plastic buckles. Elasticated drawstring around chest with side adjuster straps for snug fit. Opposed buckles allow waders to be rolled down into a waist wader. Inside flap pocket.  Tightly woven 150D Rip-stop Ballistic Nylon outer to resist thorns and abrasion.  Inner PVC coating ensures they remain 100% watertight.  Double-stitched seams heat sealed on the inside for added strength.  Quality two-tone PVC boot.  Two sole options: deep cleated or combination Combi Felt- Sole.